The view from the new Stressless View must be experienced! 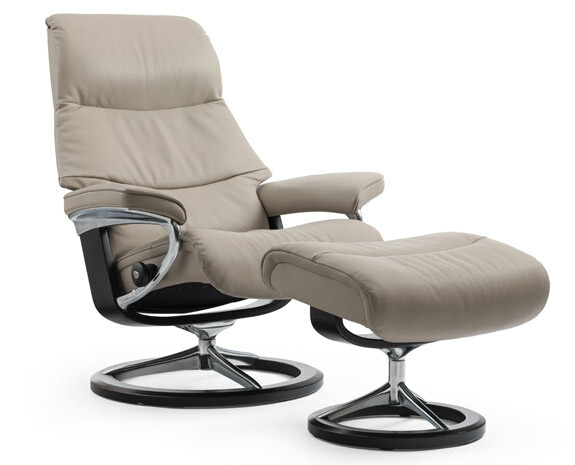 Stressless View has soft padding and a timeless and modern cushion design with clean lines. This model has an extra tall slim back, particularly suitable for those of us who like to stretch out. The model also has an elegant and comfortable neck cushion, which can be adapted to users with different heights to provide perfect neck support. The chair also uses the latest signature frame, an elegant combination of wood and steel, which has the revolutionary Balance Adapt™ system built in. The innovative BalanceAdapt™ system, is a newly developed function that provides an added dimension to the comfort experience. The chair’s back and seat automatically adjust the seated position according to the movements of the body.